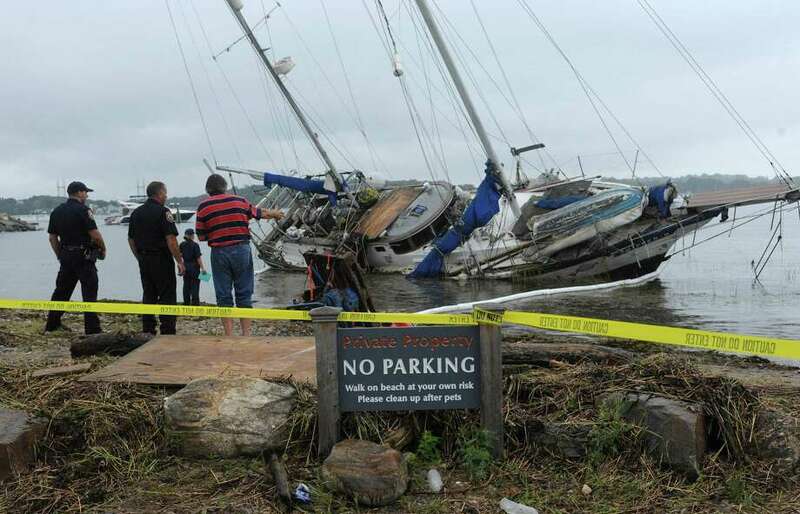 WESTPORT — Two weeks ago, following a different storm than the one that struck Westport this week, a Weston resident’s boat broke free from its mooring and washed up on the Saugatuck Shores. The boat is still there. Even before the incident, the boat’s owner, Ed Train, received criticism from Westport residents who called his boat disheveled. Train, who has maintained permits to dock his two boats at the Westport shore for the past 20 years, himself admitted his boat could use some TLC. Both of Train’s boats became unmoored on the Sept. 10 storm, though his other boat, which washed up near the bridges on Harbor Road, has received less criticism than his boat stuck on the Saugatuck. Giunta said Westport Deputy Police Chief Samuel Arciola is helping to handle the removal of Train’s boats, but Arciola was not available for comment. “The owner was in contact with the Coast Guard and two salvage companies and we’re still in the process of removal,” Lt. Jillian Cabana with Westport police said. Train did not respond to repeated calls about the status of his unmoored boats. At the time Train’s boat washed up on the Saugatuck, onlookers reported an oily smell and expressed concern contaminants may have leaked from the boat. “I’m working with the Coast Guard right now to meet all of their requirements to ensure there’s no further contamination,” Train said in the days following his boat’s unmooring, adding he wants to save his boat and is making preparations to do so. “This is a legal, seaworthy vessel, although it may be cosmetically challenged,” Train said.